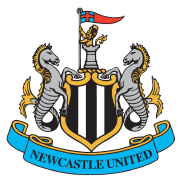 Newcastle United football clubs badge is yet another that is an adaptation of the citys coat of arms, it was developed in 1988 and as mentioned above takes its lead from the official coat of arms which is shown below. 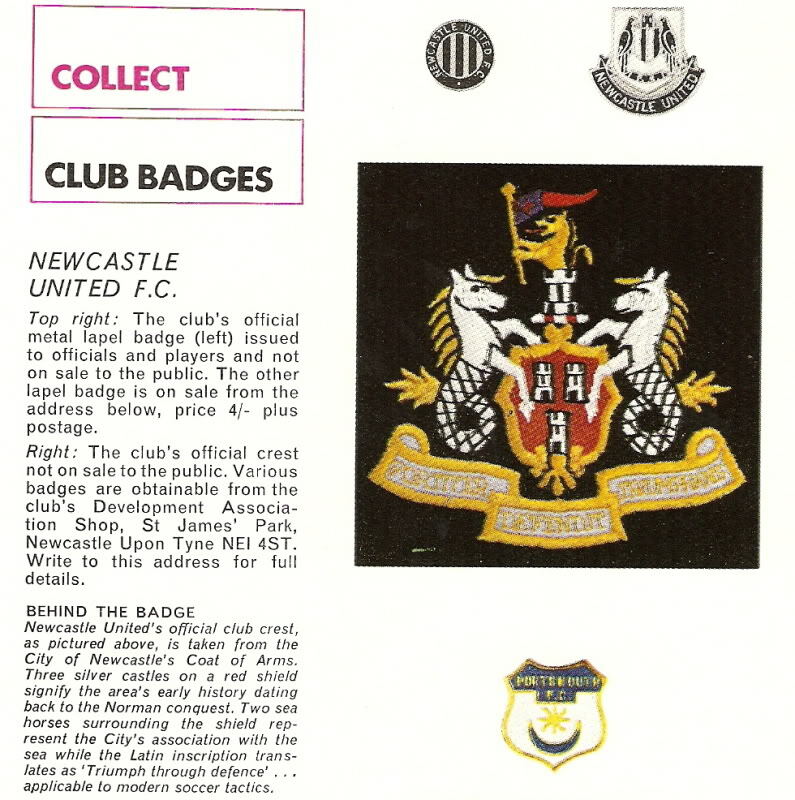 Prior to 1988 Newcastle did occasionally use the city coat of arms as can be seen from the badge below that was part of an Esso football badge promotion in the early 1970’s. 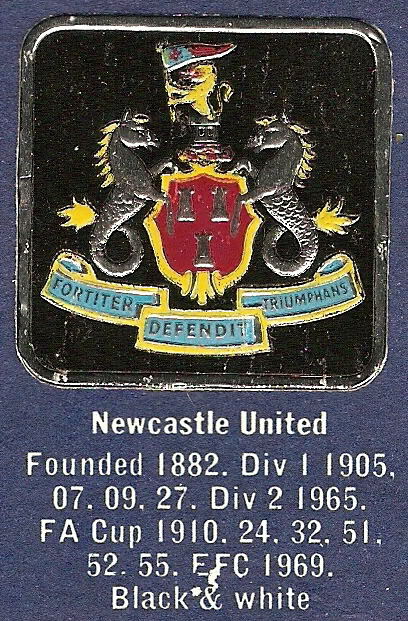 Another version of the Newcastle United badge is shown below, this one appeared in a Football Review magazine in the late 1960’s. This also comments on the Latin motto but with a slight difference in translation, their interpretation being “triumph through defence”. The 2 mythical seahorses represent Tynesides strong connection with the sea. The castle motif is a link to the towns Norman keep and a reference to the historical background as to how the town got its name, namely that it took its name from the “new castle” that was built by the son of William the Conqueror. The black and white stripes don’t appear on the citys coat of arms but their appearance on the football club badge is a fairly obvious one and surely doesn’t need explaining !! Another deviation from the coat of arms is that of the team name being added to the scroll, the original crest included the Latin motto “Fortiter Defendit Triumphans” which translates to “Triumphing by Brave Defence” !! Amongst the thousands of football badge designs there is one area that offers an opportunity to use the same design over and over again and that is the "match" badge. Once the initial design has been chosen it doesnt take much imagination to see that all that is required from then on is to change the date and opponent. Of course what this does is create an extra burden on serious football badge collectors who HAVE to get each and every one !! A nice set to collect is the Newcastle United official badges, these are only issued to corporate guests at St James Park so unless you know someone who works for the club and can get you them you have to rely on these coming up on Ebay or car boot sales. Below is the design for each season that we have, if you have any others please let us know as we are always on the lookout to expand our Newcastle football badge collection !! Of course theres not only the club itself who produces badges, theres loads of suppliers who produce match badges as they know there is a big demand for them, hence the "badge men" outside the grounds on match days. 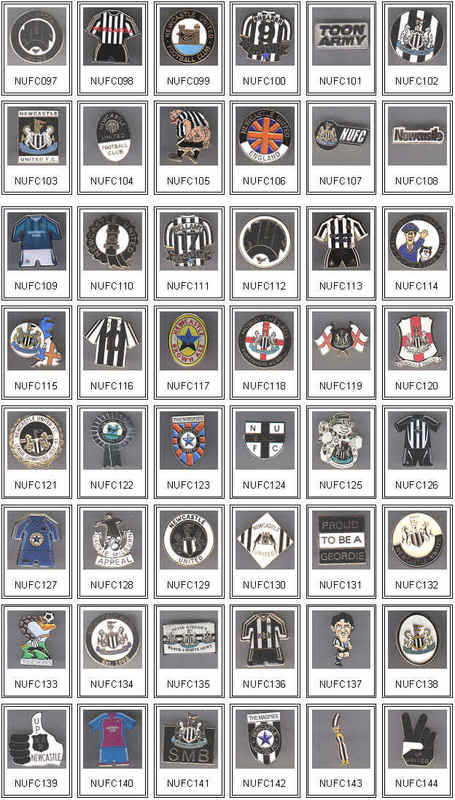 Below is a sample of the many different Newcastle United badge designs I have picked up on my travels. 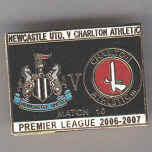 The badge above was for the 2006/07 Premiership game between Newcastle and Charlton, this design was pretty common that season and could be picked up for £2.50 from the badge man on the corner opposite Rosies pub near the ground. The three badges above are from various testimonials that Newcastle United have been involved in, in these instances Norwich, Liverpool and Spurs. 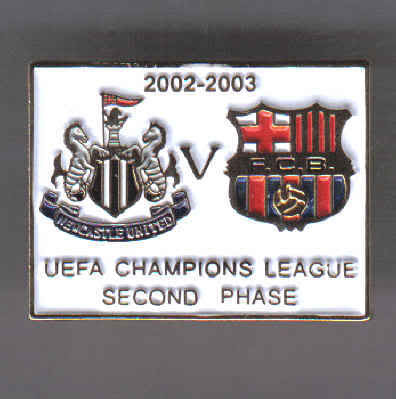 Not all "match" badges are for specific games, the two examples above show the 2002/03 Champions League groups that Newcastle were involved in, both the First and Second phase. A specific match badge for the second phase against Barcelona. 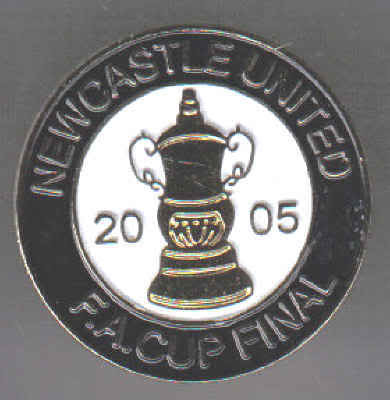 Another example of a group specific badge, this time for Newcastles UEFA Cup campaign in the 2006/07 season. There is of course lots of different designs for just about every game which is why it would be nigh on impossible to show all of the match badges available. The above three portray that, all three were specifically for the Newcastle United Man U FA Cup Final in 1999. The problem for match badge suppliers is of course the length of time it can take to get a badge made, the supplier has to get the design to the manufacturer in plenty of time prior to the game itself. Obviously the best time to sell a football badge in great numbers is at the actual game itself. This sometimes leads to problems, a classic example is the badge above portraying Newcastles appearance in the 2005 FA Cup Final ..... only problem was they got knocked out by Man U in the semi final !! The supplier had obviously taken a chance on getting these in time which ultimately didnt pay off, brilliant for the collector of course as these will be pretty scarce. 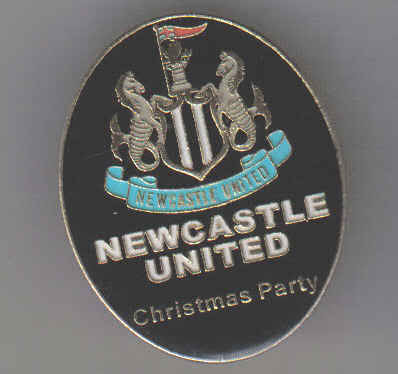 Another area of Newcastle United badge collecting worth getting into is that of their official party badges. As a lot of clubs do now Newcastle use their stadium (St James Park of course) for functions on non match days. 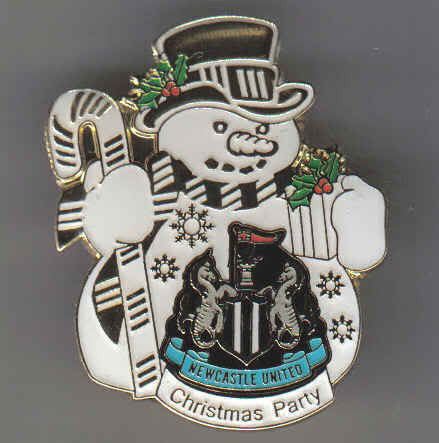 These include Birthdays and Xmas parties, I believe they can actually hold weddings there now as well so it remains to be seen whether there will be a range of Newcastle Utd Wedding badges !! At these functions badges are sometimes given out as mementos, these of course are very much sought after by badge collectors as they arent actually (to the best of our knowledge anyway) available commercially so the only way you can get hold of one is either by attending one of the functions or knowing someone at St James who can get them for you, or using Ebay of course. 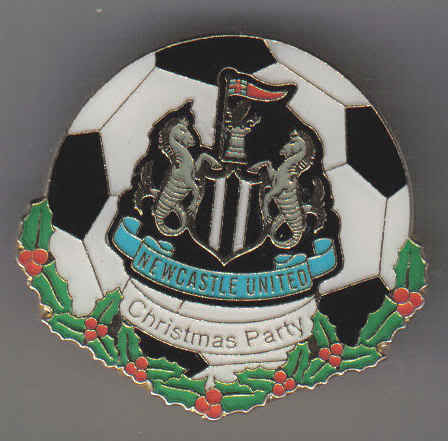 According to a couple of people we know who have been to these parties there is always loads left on tables and dropped on the floor by people who dont realise that there is badge collectors out there who will pay good money for this type of football badge so chances are they will pop up on Ebay regularly from people who have had the sense to pick a few badges up when they leave !! The badges we have got hold of are shown below but we know for sure that there are other Newcastle party badges about that we havent managed to track down yet. So obviously if youve got one of these badges please either send us an image or better still tell us how much you want for it and we might buy it off you. 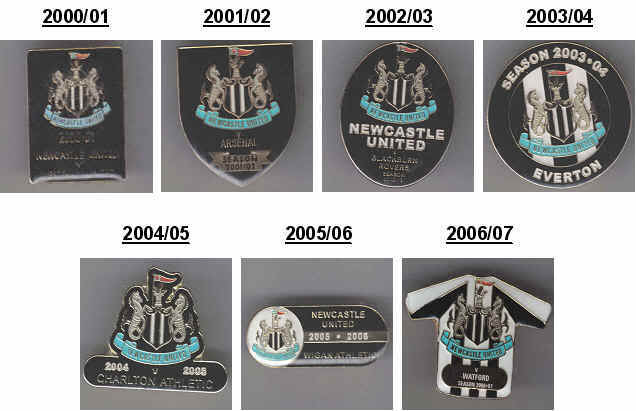 The badges themselves dont seem to have any dates on them so we dont know if they are from one specific year or whether Newcastle have a range of different badge designs that they give out randomly, again, if you know the crack get in touch. 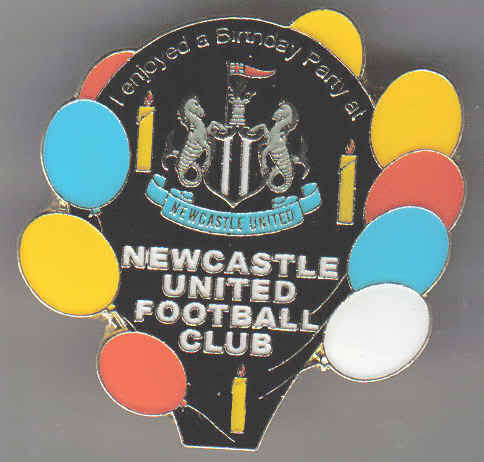 The above badge is the only one we are aware of that has been given out at a Birthday party at St James Park, if you have any different badge designs let us know. A couple of "wreath" design badges that are not your normal style of football badge but are still well worth a place in anyones collection. A more traditional style of Xmas badge, again though its not the sort of thing you will find all the time so a great addition to your football badge collection. 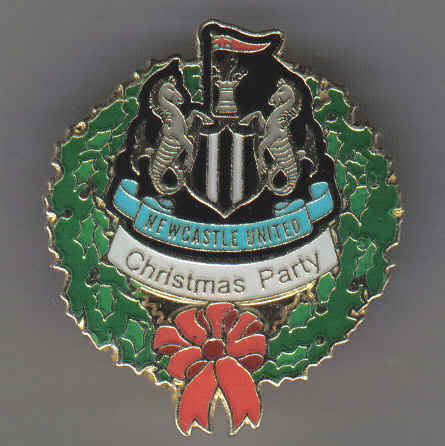 The badge above is a pretty boring design really for a Xmas party, exactly the same design as the match badges given out in the 2002/03 season so perhaps its from that years party? We arent sure but as its a football badge it gets a place in our collection !! 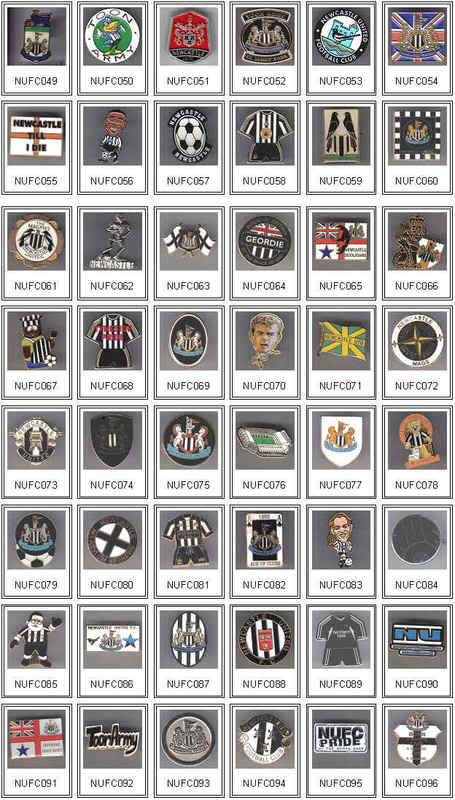 Below is just a few of my Newcastle United football badges, the plan is to get my entire collection up over the next few months, however I have about 250 -300 so its going to take some time !! !